Be Known for Something : Discover Your Church Communication Thread / Random Thoughts / A Nasty Vine. Get Rid of It! Yesterday, it was a perfect time to clean up our yard. Our Christmas parties are done, so we had the whole day off. It was cold, not windy and we’ve been “collecting” downed limbs from our huge (aging trees). It was time for a huge bonfire. From previous blog entries, you may think I’m a pyromaniac. And with the delight of the blaze licking through our pile of sticks, I think it established in my mind, what the kids have always known. I’m am indeed a pyro. My two sons and I, with the help of a couple of burn barrels we had 3 huge fires warming the air. Our neighbors even came over to wish us a Merry Christmas. It was fun. While it was burning, we took turns tending to the embers and flames. But since we were acclimated to the “almost” freezing temperatures, we started doing some raking, sweeping and trimming around the yard. Then, I noticed our beautiful tree at the end of our driveway — the one that has stunning yellow blooms on it in the spring. I found it odd that it still had green leaves covering it. As I got closer I realized that the leaves on the Forsythia (I think that’s what it’s called) had all fallen. The waxy leaves that covered the bush, were in fact, a nasty vine. As we stripped away the winding entanglement, we realized that all the vines came from a couple of stems near the base of the shrub. Throughout the growing season, we hadn’t realized that this fast growing vine had made its way up through the bush. Because both had green leaves, it covered the bush without us noticing. Until the weather change allowed us to notice it. 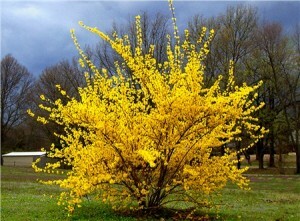 Upon closer examination, the vine had almost completely stunted the growth of the beautiful Forsythia. As I shared with my son who was amazed at this vine too, I think this is exactly what the Bible means when it cautions us about the “sins that so easily entangle us“. What sins are those in your life? You know, the ones that creep into our lives and look like they’re “good” for awhile, then they entangle our lives and stunt our growth. Spiritually and even physically. They take root and grow larger and larger, until we realize that they’ve taken over our lives and minds. The same thing has to happen to those sins as we did to the vine. We untwisted and removed every component of them. We even found it easier to cut it off at the root. Then we gladly burned them to destroy even the memory of them. With our sins, God promises to throw our sins away from us — as far as the east is from the west. Lord, help us spot the vines. Keep them from growing in our lives!